New technologies and designs have solved the problems formerly associated with Electronic Water Level Controllers. Electric water level controllers first appeared on the market in the early 1990s. They were initially hailed as a great advance in technology versus the original “toilet tank” float. However, the inherent problems with electric water level controllers soon became apparent once in the field. The two major problems with virtually all of the electric water level controllers were poor durability and high cost of replacement. Both problems were the result of faulty design and manufacturing process. Originally, cooling tower manufacturers purchased off-the-shelf electrical parts and assembled them in a generic design suitable for most basic operations. These units had no intuitive user interface to enable operators to easily verify operation or trouble-shoot when problems arose. They also were not designed to integrate with building automation systems. Another cause of poor durability in the electric water level controllers was the use of high voltage (up to 600 volts) in the wet environment. This high voltage caused the sensing probes to rust, plate minerals from the water or completely deteriorate at a very high rate. In the wet environment, the electrical parts failed quickly and often. With no built-in diagnostics function, it was impossible to identify the cause of the failure or even which parts had failed. When this happened, because of its design the entire unit had to be replaced at considerable expense. This negative situation created many unhappy operators as well as embarrassment and loss of trust for sellers, manufacturers and specifying engineers. Solid state electronics in the new Electronic Water Level Controllers have now eliminated the durability problems inherent in the previously used off-the-shelf electrical parts. The only moving parts in the new designs are the relays which can be easily tested and inexpensively replaced by any electrician or skilled operator. This advanced modular design eliminates the need to replace the entire unit—creating considerable savings over the lifetime of the unit. The solid state electronics also enable the use of lower voltages. This helps to minimize or eliminate the rusting, mineral fouling and deterioration of the sensor probes—significantly extending the useful life of the electronic water level control. 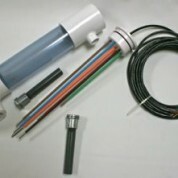 In most cases, the total lifetime cost of operation and replacement parts for the new electronic water level controller is less than that for the original “toilet tank” float design. Software now controls all functions of the relays. It enables operators to easily verify proper operation with a simple visual scan of the LED lights associated with each function. The integrated firmware and dry-contact digital circuitry allows the new electronic water level controllers to easily and quickly connect to building automation systems for continuous monitoring. The above advancements in technology and design have eliminated the problems of poor durability and high cost of replacement inherent in the original electric-relay water level controllers. The new solid state electronic water level controllers with integrated software now offer hassle-free installation, superior performance and minimal cost of operation for many, many years (much longer than the lifecycle of original electric designs).